Interest in Austrian wines is on the rise. Given the drinkability of many of the wines, it's no wonder that those who actually "drink" wine (as opposed to those who merely "collect") are discovering these. We have access to many of the wines from the top Austrian producers. Like every other part of the wine world, our modest selection is based on our tastings, with an eye towards value. If we don't have what you want, perhaps we can order it for you. 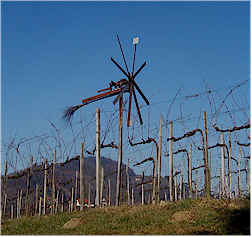 Most of the firms importing Austrian wines view these as an auxiliary part of their portfolios. Staying "current" is difficult, since there is not a huge demand for these and the importers of these are too small to make much of a 'career' out of representing solely Austrian estates. 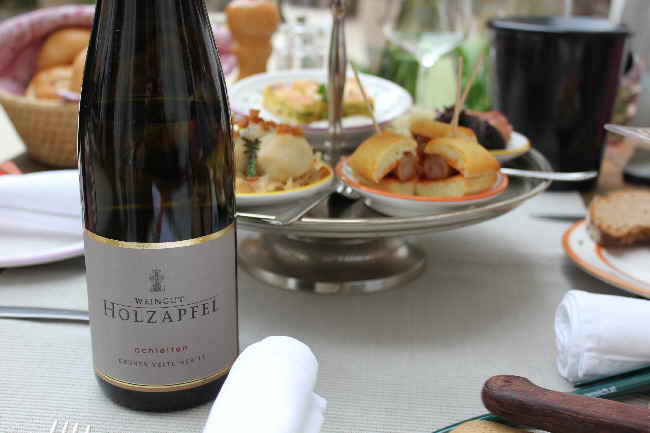 The Holzapfel (this name translates to 'wood apple' in a literal sense and crab apple in reality) family has its hands full, what with running a hotel, restaurant, vineyard, winery and distillery in the town of Joching. This is situated in the famed Wachau region, an area some consider an elite site for Riesling and Gruner Veltliner. This "Mom & Pop" winery also has a small "bed & breakfast" as part of the business, along with a restaurant which, curiously, is open for lunch and closes around 6pm. Karl Holzapfel is a thoughtful viticulturist and winemaker. His father started the winery in 1967 and, at that time, they owned but 4 or 5 hectares of vineyards. Karl took over the cellar in 1987 and today they have 14 hectares of vineyards. He's a stickler in the vineyard and works diligently to avoid the onset of botrytis cinerea during the growing season as well as at harvest. Apparently, as we understand it, the various critics who rate wines on their 100 point scale, often are more easily seduced by wines with this additional dimension. Karl finds the honeyed notes of botrytis to detract from the purity of the fruit, so he seeks to avoid it, preferring to highlight the grape and its particular terroir. Karl says he made some changes to various practices when he took over. He spends more time in the vineyard, saying that's where you find the quality of the wines. He also prefers to settle the juice prior to fermentation. And today's fermentations are controlled by temperature in an effort to preserve the fruit. The wines are also kept on the 'lees' longer than in Dad's era. "They used to filter the wines in December. I leave them on the lees longer and this produces a more complex bottle of wine." says Karl. We have had a number of years to follow this estate. The wines are routinely very good quality and well-regarded by Austrian wine enthusiasts. He's not one to really toot his own horn, so the winery doesn't receive all the critical acclaim it deserves. Currently in the shop is a Gr�ner Veltliner with the Zehenthof designation. CLICK HERE TO SEE THEIR WEBSITE FOR INFO REGARDING ROOMS or THE RESTAURANT. Karl asked if I would like to taste his Pinot Blanc. It's matured for two years in oak and this means there is "holz" in a Holzapfel wine! Fans of lavishly-oaked California Chardonnays would find this to be exceptional. 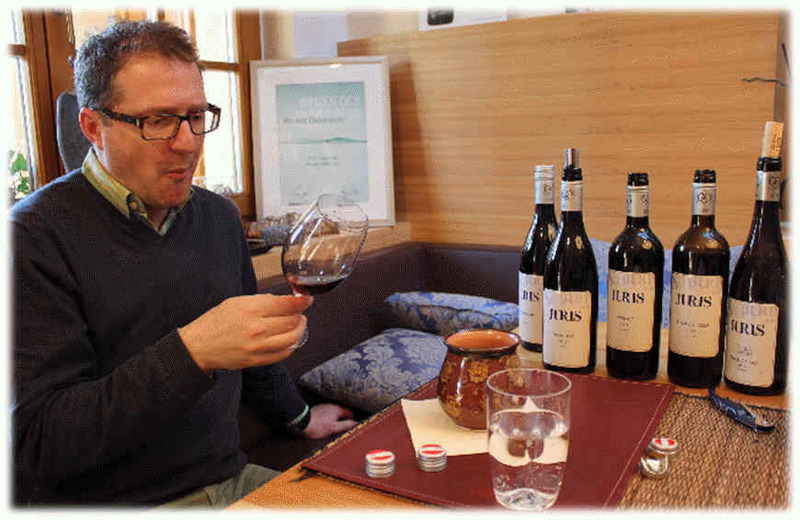 Gerald Malat ranks as one of Austria's leading winemakers. He was one of the first to mature some of his wines in French oak barriques and perhaps the first to produce an estate-bottled bubbly. Years ago we paid a visit to the Wachau region and tasted 70 or so wines in the Vinothek at Kloster Und. This was in the Dark Ages, as Austria was still under the cloud of their "scandal" and not so many wineries were dedicated to making quality wines. My favorite wine was a Chardonnay from Malat. I bought a few bottles, unaware that may German pals had booked an appointment with Malat at his little winery in Palt. It seems the same wine had won a blind-tasting of theirs and they wanted to get to know the wines better and buy some directly from the estate. Malat's wines were uniformly good. I recall, too, tasting many fine distillates there, as he makes some outstanding liqueurs and schnapps. We've had Malat's wines in the shop, off and on, ever since. These day Malat's son Michael is now part of the business. Their 2009 Gr�ner Veltliner is a good example of Austria's famed white grape. 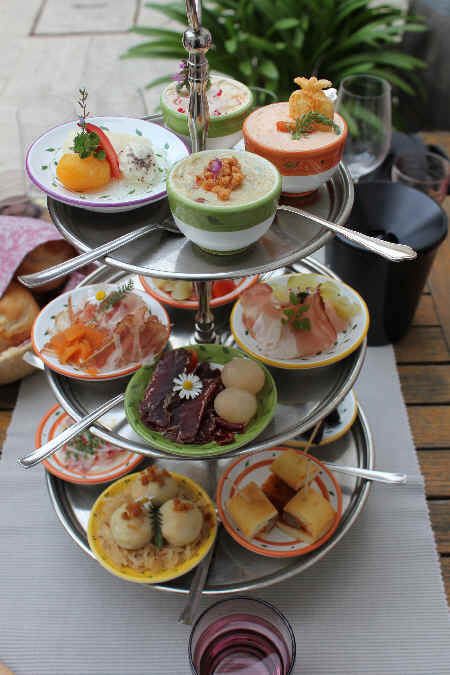 The wine is dry, medium-bodied and well suited to lighter seafoods or service as an aperitif. The 2009 Riesling is also dry, more fruity and mildly floral. You can serve it with all kinds of foods: fish, Asian-styled cuisine, smoked pork chops, etc. The Brut sparkler is a nice, dry bubbly...definitely NOT Champagne, but quite good. Rather dry, too. I know Malat's been making this for years. 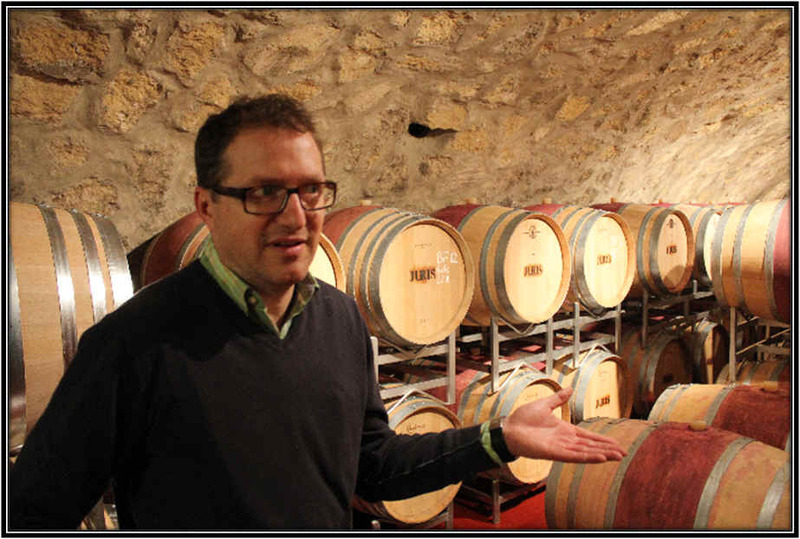 On our first visit, many years ago, Malat had been visited by a group of French winemakers. One prominent Champagne producer gave him some tips to make the wine more along the lines of a French Champagne. 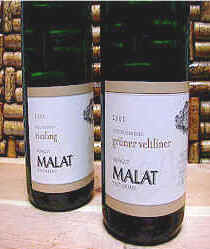 Malat told the fellow he was not interested in making French Champagne, but in Austrian sekt. There's a nice, light Pinot Noir. This wine displays some good cherry fruit and a bit of wood. We had a bottle with a winter-time platter of sauerkraut, smoked pork and various sausages. This was impressive in that setting. A Cabernet was very charming as a barrel sample. It is not hugely tannic nor astringent as it's intended to be drinkable in its youth. Lots of dark fruit and a nice touch of oak. UPDATE: Malat changed importers recently and the price of the wines, as a result, has escalated nearly 40%! Wine we had been offering for $15.99 per bottle would be $22 for the following vintage. Malat in his fermentation cellar. Though he uses a lot of small French oak barrels, you'll see a fair bit of large cooperage, too. After the wines are transferred (racked) out of oak, the wood barrels need to be cleaned. Gerald Malat opening a bottle of his fantastic Reserve Cabernet. We also tasted the 2003s from barrel...very promising wines! 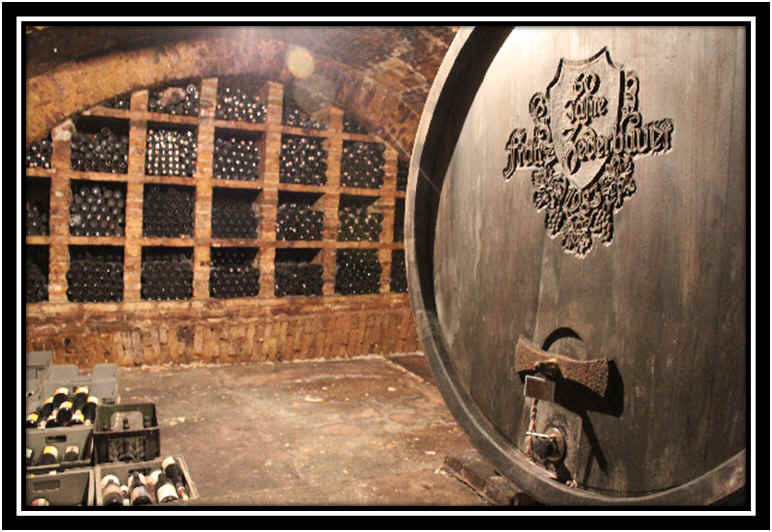 This is the Wachau's oldest winery and it's owned and operated by the Saahs' family. These people farm their vineyards according to the principles of "bio-dynamic" farming. This is not only "organic farming," it's more difficult, more demanding and more intense. Nikolaihof makes a range of wines. 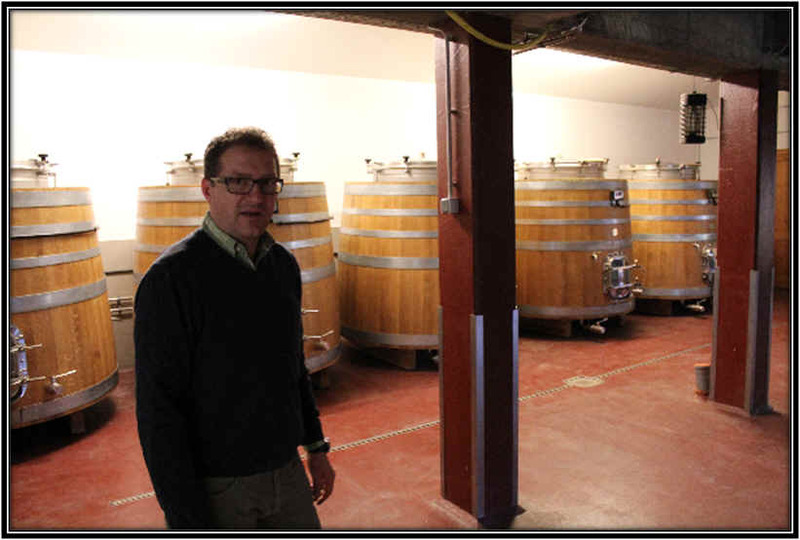 We're typically interested in their Hefeabzug (wild yeast) bottling of Gruner Veltliner. The wine is quite different from the California Chardonnay you might be accustomed to drinking. First, it's only 11% alcohol, not 14.3%!!! This wine is aged on its spent yeast for a few months, so there's a mild yeasty note to the nose. I also like the fresh appley fruit and the crisp acidity. Christine Saahs shows us how healthy the soils and vines are. The vineyards are impressive and though we tend to be a bit cynical and skeptical, the wines speak for themselves. Like many vineyards, Nikolaihof's feature a rose bush by every row. This allows the grower to monitor the vines' progress as a rose bush is susceptible to the same maladies as a vine, except they show the problem well before one would see the effects on a vine. 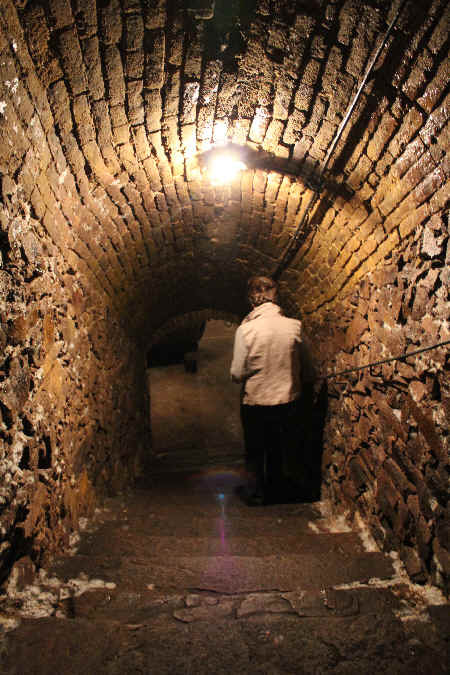 The cellars are old and very traditional. I think this is a replica of Austrian wine guru Terry Theise. We tasted many wines on our visit at Nikolaihof. Very impressive. Christine sits for a rare moment to have a sniff and a taste. Many bottles were opened for this visit! We presented Christine with a "loud" apron which she seemed to enjoy. We tasted superb dry Rieslings from this little estate in Austria's Kremstal region. And we've been fans of the Gr�ner Veltliner, here, too. Geyerhof is owned by Ilse and Josef Maier have about 15 hectares of vines in the town of Furth, close to the Danube River. It's close to an hour's drive from Vienna to the Geyerhof winery. The Maiers are big proponents of organic farming. Ilse Maier has even written a book on the subject! And while many vintners today tout "organics" as a marketing tool, this estate was doing the right thing long before others even gave it a thought. The property encompasses about 20 hectares of vineyards, though in 1986, at the outset, she had a mere 5 hectares of vines. The old buildings at this lovely winery were originally horse stables and a brick-making facility. It's been in her family since the 16th Century she says. But there's another surprise here...a second level below the first...a cellar known, according to Ilse, as the "French Cellar." 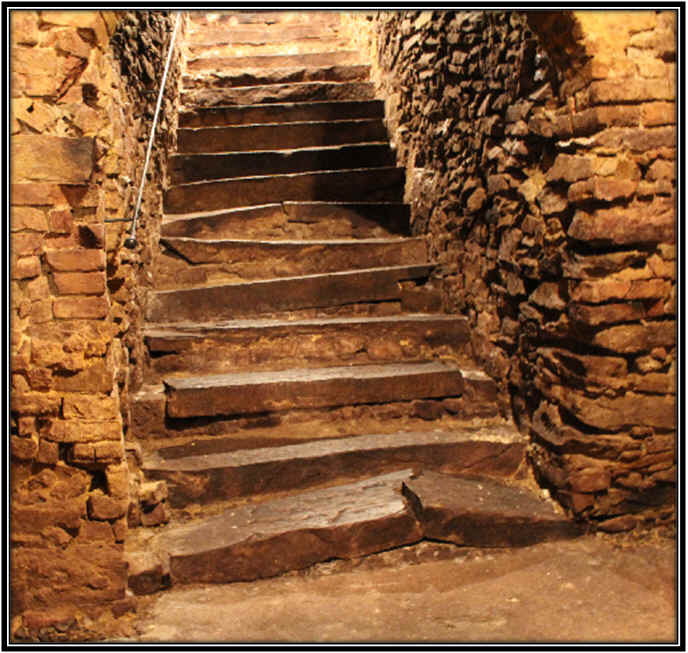 That's because the cellar was covered and hidden from the French soldiers who came to the region as part of Napoleon's army. It's an impressive old place and remarkable to visit and contemplate the history of such a site. Today there's a nice little "library" of bottles residing there. The Riesling comes from their Sprinzenberg vineyard and it's a beauty! The aromas are intense and classic--nice floral notes with a fruity element and an underlying minerality. The nose and flavors recall nectarines and peaches and then there's that wonderful stony element on the palate. The wine is dry, but it has intensity and length. We suspect this would age well, but don't expect anybody will be able to keep their hands off it as a young wine. The 2015 Gruner Veltliner is a delight...classic and quite dry. It's from a site called Rosensteig and this is a terroir that's "loess," a silty/sandy mix with a small percentage of clay. The wine is dry, of course, and features some of the fruit, flower and spice notes we like in good Gr�ner. Ilse says she prefers to pick this vineyard "not too late so I have lower levels of alcohol. But I don't harvest too early, either, because I don't want 'green' aromas. There must be a real ripeness or maturity level of the fruit." We were privileged to taste a 1977 Gr�ner that Ilse's father made...tasted this in 2014...still alive and kicking. We suspect it started out with less stuffing and character than the wines being made today, but it demonstrates the staying power of Gr�ner Veltliner. A new little project is called Wild Wux. It's made at Geyerhof in collaboration with a neighboring vintner...and both parties share a love of nature and environmentally responsible actions. So Ilse and her friend Birgit Braunstein came up with the idea of making a special wine and donating some of the proceeds to restoring a wildlife habitat. The grapes were hand-harvested and the fruit whole-cluster pressed. Fermentation took place in stainless steel and the wine remains on the spent yeast for a brief time frame and then bottled about four or 5 months after the harvest. We're enchanted by the freshness of this lovely wine...it's dry, crisp and has the hints of grapefruit and spice we look for in good Gruners...Don't have any in stock presently, though. This is a famous estate and when you taste a range of their wines, you'll understand why. Located in the region of Kamptal, the winery is in the town of Langenlois, one of Austria's biggest wine villages. The Br�ndlmayer family has about 60 hectares of vineyards, so this is not a particularly tiny winery. Yet the quality of the wines is remarkably consistent and precise. About a third of the vineyards are planted to Gr�ner Veltliner and organic farming is the program here. We have a superb 2009 Gr�ner Veltliner designated "Kamptaler Terrasseen," as the vineyards are on little terraces. Cultivation is of great importance and the Br�ndlmayers work hard to grow the best possible fruit. They even use a special type of wood for this wine, preferring Acacia wood for Gr�ner Veltliner, while they use oak for their other wines. We like the minerally tones in this wine and that it's bone, stone dry. 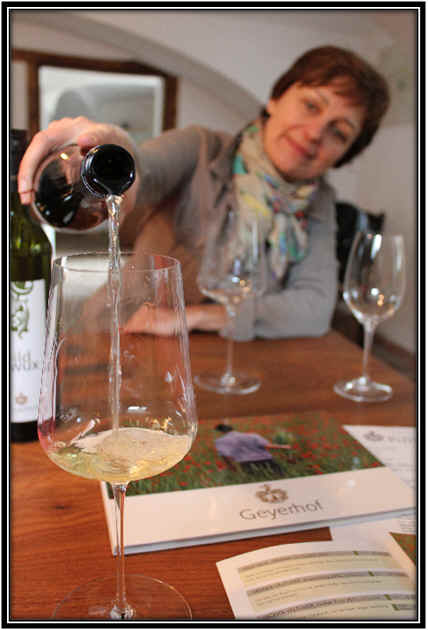 You'll also encounter the lovely spice and grapefruit peel character typical of Gr�ner Veltliner. Very fine. Riesling is another specialty here and recent vintages have been very fine and of excellent quality. They've been dabbling with sparkling wine and the last few vintages we have tasted have been stellar. They've really done their homework in figuring our what goes into making a good French Champagne and then what makes a similar quality bubbly with an Austrian accent! While we typical measure sparkling wines from everywhere using "Champagne" as the reference point, I can tell you Brundlmayer's is easily comparable to seriously good French bottlings. The vineyard sites for this tend to be fairly chalky and southeast facing. 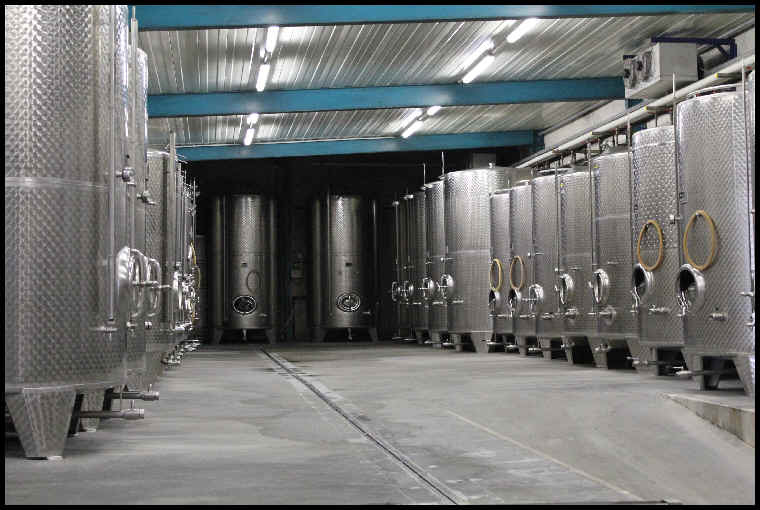 The juice from the various vineyards is fermented in stainless steel tanks and they encourage a secondary, malolactic fermentation to reduce the acidity and give the wine a bit more of a rich texture. Then it goes into seasoned cooperage for some wood aging, not so much for oak character, but to give additional texture and complexity to the base wine. This, then, spends about a year and a half on the yeast after its secondary alcohol fermentation in the bottle...the blend is uniquely Austrian: Pinot Noir and Chardonnay for the most part, with small amounts of Pinot Gris, Pinot Blanc and Gr�ner Veltliner. What a complex, delicious and satisfying bubbly! 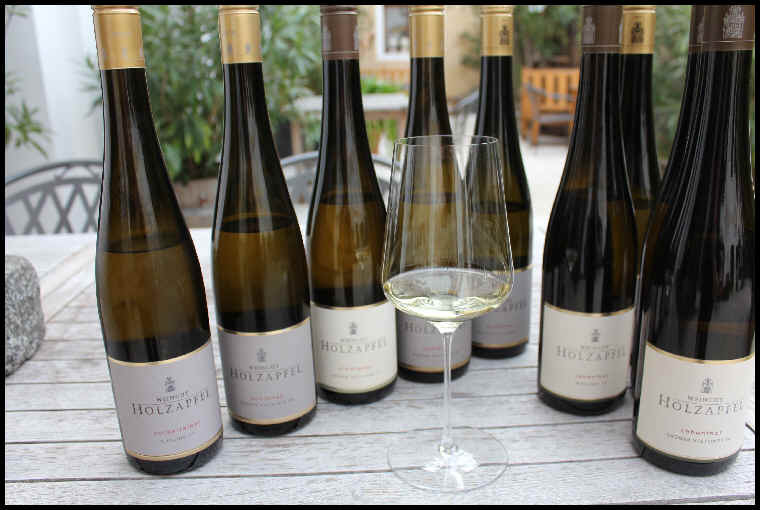 We just picked up some bottles of a library release of 2008 Riesling...their Z�binger Heiligenstein bottling. This is a really good example of a Riesling with some bottle aging. You sense the complexity and evolution of the wine, but there's still a sprightly quality here. 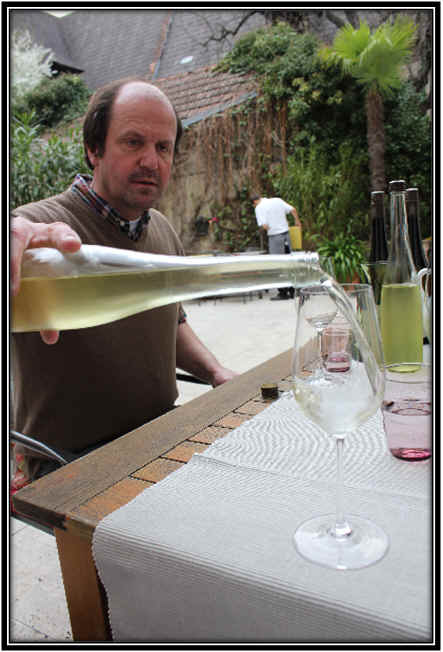 Willi Br�ndlmayer shows off a bottle of his wine. We also enjoy meeting Thomas Klingler, Br�ndlmayer's sales manager. 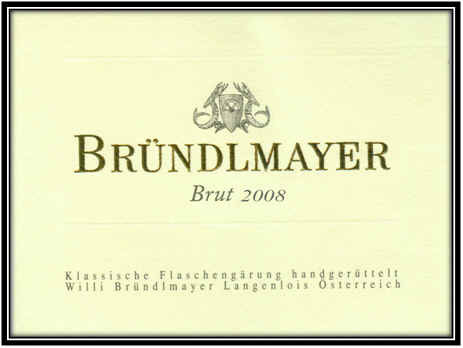 Br�ndlmayer makes a terrific sparkling wine, too. 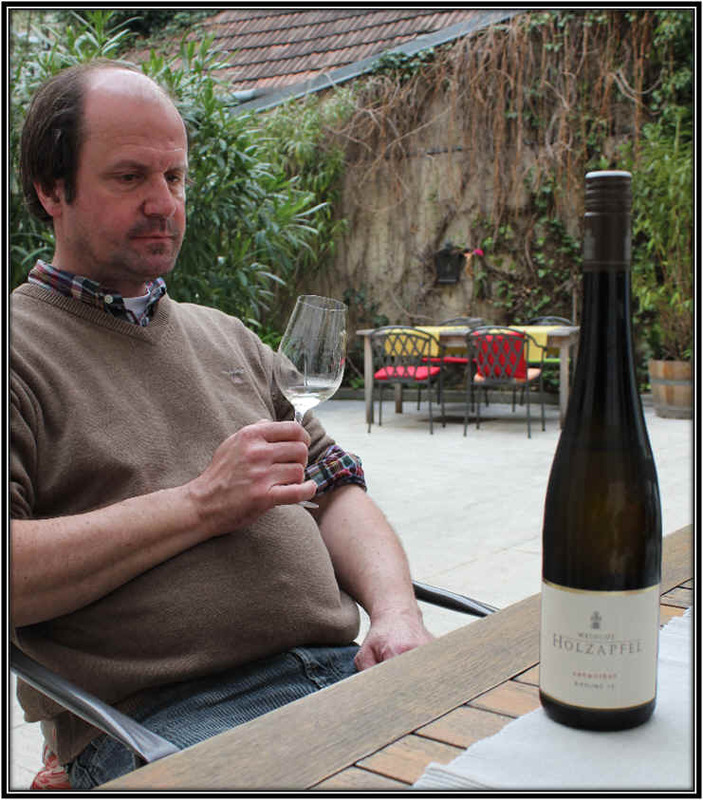 There are two Pichlers in the Wachau and both merit great acclaim for their wines. One is F.X. Pichler in Durnstein and the other is Rudi in Wosendorf. Rudi has been making wine since 1997, so he's not exactly an old-timer in the Wachau. Further, he chose not to study winemaking in a formal school setting, but instead ventured to a nearby cellar where he got "hands on" training in vinification and viticulture. Pichler has some interesting winemaking philosophies and he rolls the dice a bit. Native yeasts are employed, for one thing. For another, he's big on skin contact, even though many winemakers will tell you it's not necessary for white wine production. Pichler, though, feels a half a day in contact with the skins really brings out the full expression of the grape and its terroir. Keeping sulfite levels to a minimum is another vinification technique which Pichler employs. He feels adding sulfites immediately suppresses the 'fruit' and terroir in his wines, so he works carefully in this regard. We had a lovely 2005 Gr�ner Veltliner...a 2005 "Federspiel" level wine which offers minerally notes and the spicy tones we like in this sort of wine. The flavors are expressive and linger for a while on the palate. Perfect as a cocktail or seafood white. 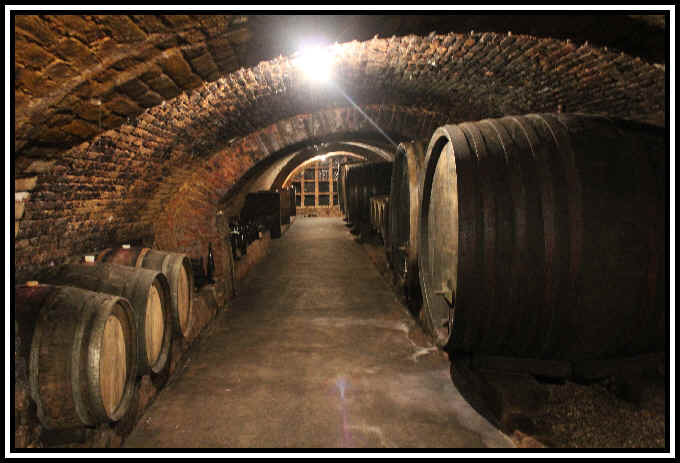 The Jager family cellar is now being operated by fifth generation Roman Jager and they're located in the Wachau town of Weissenkirchen. The vineyards comprise about six and a half hectares...Riesling and Gruner, mostly, although there are small patches of Muskateller, Sauvignon Blanc and even a few vines of Zweigelt, too. In fact, all the parcels are "small patches" and Jager tends something like 50 of them! The vineyards are now farmed organically we're told, though we don't purchase wines just because they're farmed properly...the wines have to taste good! ...It's a really good Riesling from the Steinriegel vineyard site where they tend some old vineyards...it's a Federspiel level bottling which was vinified and aged solely in stainless steel. As such it's really zesty, crisp and perhaps mildly minerally. The fruity and floral notes of Riesling shine brightly here. This little estate in Austria's Burgenland is close to the sea, allowing for cool nights to temper the vines after a tough day in the hot summer sun. IBY produces only red wines, the region being well-regarded for its Blaufr�nkisch wines (Lemberger is another name for this variety, as is "Kefrankos," its Hungarian name). Mom works in the vineyards, taking care of cultivating the grapes. Dad is the business manager and salesman, while son Anton Markus Iby is the winemaker and cellar rat. They make a nice range of wines, from good, "everyday" reds on the light side of the spectrum, to more robust, complex (and pricey) special bottlings. We recently bought a few bottles from their current distributor and liked a Blaufr�nkisch well enough to keep some bottles in the shop. It's a 2007 vintage and it's called "Chevalier." The wine comes from three sites and the vines are around 25 years of age, all in the Horitschon neighborhood. 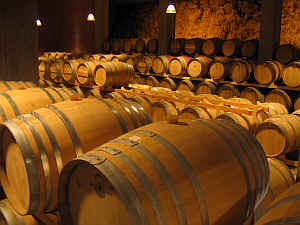 About 2/3 of the wine is matured in small French oak (some of it new) and the rest in large cooperage. The resulting wine is of Cabernet-complexity and I'd bet many tasters would peg this as a Cabernet-styled wine or perhaps they'd guess it to be a Bordeaux blend. It's medium bodied and shows dark berry fruit with a nicely cedary note from the oak. Iby's vineyards are immaculate. Many young vines. The cellars are "hospital" clean and very orderly. Here's Anton "call me Tony" Iby showing off the door to one of their large wine casks. The inside of the cask has tartrate crystals adhering to it. These are a natural "sediment" of the winemaking process. Tony "in action" in the Iby tasting room. 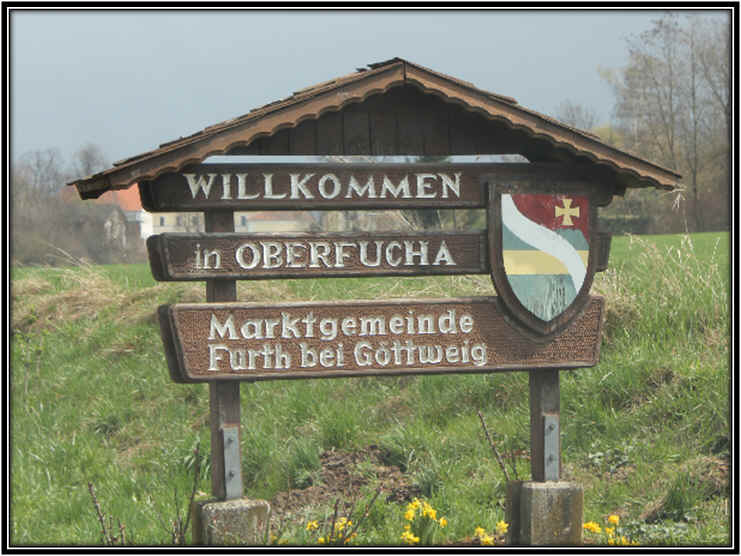 This is a "must stop" if you find yourself in the Blaufr�nkischland town of Horitschon. 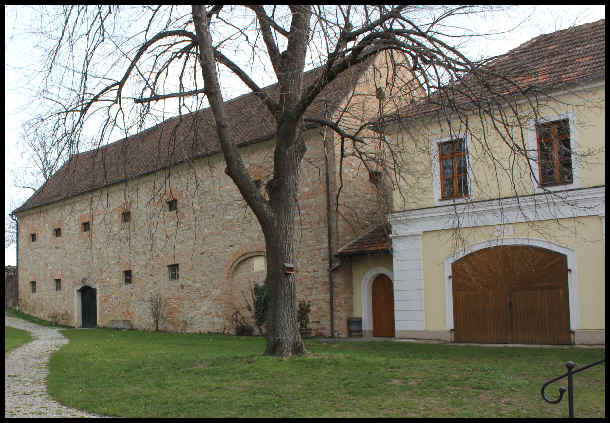 The Burgenland town of Gols is a bustling little city and just off one of the main roads you'll find the cellars of the Stiegelmar family and their Juris winery. The business is run, these days, by Axel Stiegelmar and his wife Herta. His Pop, Georg, and Ma, Theresia, put the place on the wine map in the late 1960s and it's been a well-regarded producer ever since. Axel got a good view of the wine world working at a couple of chateaux in Bordeaux when he got out of the local Austrian wine school in Klosterneuberger. Following Bordeaux, he continued to journey west, landing in San Francisco and spending some time at the University of California's Robert Mondavi Campus in Napa's Oakville. In 1990 he returned home and has been in Gols ever since. The winery owns something like 26 hectares of vineyards and father and son share an interest and appreciation for Burgundy wines. 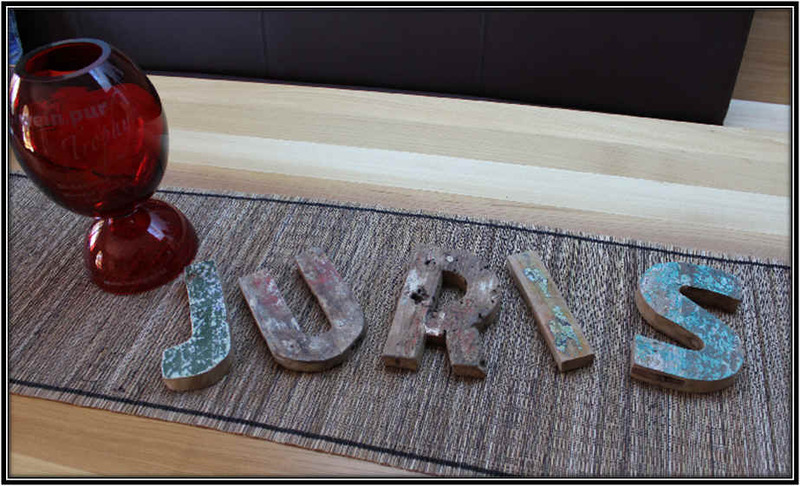 As a result, you'll find Chardonnay and Pinot Noir are prominent in the Juris line up. Most of the vineyards are in Austria, though they have a few hectares in the Lake Balaton area of Hungary with some Pinot Gris (and a bit of Syrah) in the Badacsony appellation. Georg Stiegelmar was quite a visionary! He was the first Austrian vintner to use French oak barrels for red wine...that was back in 1983. 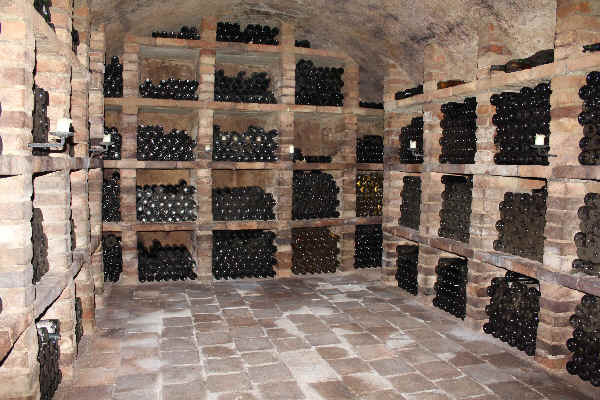 Their cellar in Gols is very environmentally-friendly and energy-efficient. It's a gravity-flow winery and they are very proud of their "Passive Energy" building which maintains a constant temperature year round. If you get the chance to taste the Juris line-up, you'll find good Sauvignon Blanc, certainly of a quality which many California winemakers would be pleased to have. Pinot Gris (from the Hungarian side of the 'domaine') is also very fine and mildly creamy in texture. Reserve Chardonnay is a ringer for many North Coast Chardonnays from California, probably a result of Axel's studies at that University of Mondavi some years ago. Sixty percent of the Juris production is with Pinot Noir and St. Laurent. These, too, are quite good and display brilliant varietal character. Stiegelmar prefers a hedonistic approach to wine drinking. "As a wine drinker, I simply want to enjoy a wine. I don't want to fight with a wine, so achieving balance when making our wines is the key." They make a Blaufrankisch called "Tricata" which is a tip of the cap at Sforzato or Amarone wines from Italy where the grapes are dried a bit before crushing and vinifying them. They've been making Tricata since the 2006 vintage. We have a nice Zweigelt in the shop. There's a bright red fruit aspect to the wine. Oak is not much of a feature of this wine and this is probably for the best, since the grape's varietal character comes to the fore more easily, though it was matured in seasoned oak cooperage. It's a reasonably soft, supply wine so you can see Stiegelmar's 'balance' has been achieved. "I like to build a wine from the ground up." said Axel. 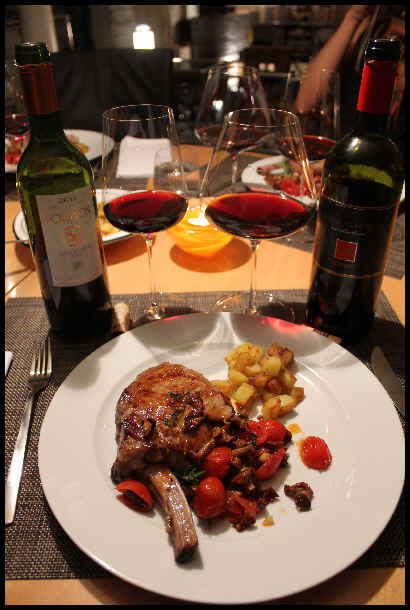 We prefer this wine served at cool cellar temp and it pairs well with pork, chicken and mildly-seasoned red meat dishes. 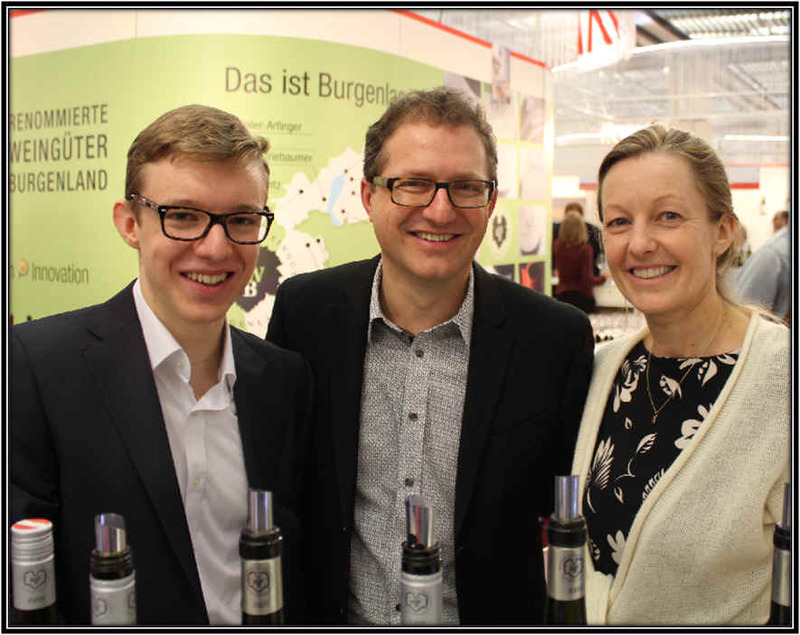 Young Gregor Stiegelmar, his Pop and Mom, Herta at a little wine fair in 2014. Their wines are routinely good, so it's no wonder everyone is smiling! These fellows are located in Styria, the "Steiermark". More precisely, they're in the S�dsteiermark. If you visit this winery, you actually drive PAST a customs' checkpoint! Fall off the Polz' balcony and you're in Slovenia. The brothers decided if they continued making wine in the same fashion as previous generations, they'd merely be "farmers." Striving for superior quality, they felt they could make a name for themselves. And that's what they've done and continue to do. Yields in the vineyards are reduced in order to maximize quality. The wines are vinified in impeccably clean cellars. Some wines are matured in oak, others seeing no wood at all. Their Sauvignon Blanc wines are routinely excellent. Though New Zealand has burst onto the scene over the past few years, there are a number of Austrian Sauvignons which are at least as compelling as the Kiwi wines. Unfortunately, these are well known bottlings and they cost more than those famed New Zealand offerings. I selected Polz's "normal" bottling of Sauvignon, as it is within the realm of reality, price wise. The wine has spot-on, citrusy Sauvignon character. It is a perfect aperitif or seafood white and will pair handsomely with Asian-styled foods. While we've enjoyed their wines, the prices asked by the local importer a few years ago really slowed down sales. A new importer was appointed in 2004 and the wines are still ambitiously priced (Klassick Sauvignon would wear a $35 or $30 price tag!) As a result, we won't be offering these in the future until someone comes to their senses. Photo: This is called a "klapotets." You'll see these all over the Steiermark region as they're used to scare away birds which might have an interest in eating the grapes which are ripening on the vine. Photo is copyright of Weimax and was taken by Gerald Weisl. I have seen this producer's wines mentioned in various European wine magazines as they make some excellent wines in the Styria region. Tement is regarded as one of the top three producers of white wines in Austria's Steiermark and his expensive Zieregg Sauvignon Blanc is close in quality to the barrel-aged Pouilly-Fum� wines made by France's Didier Daguenau. Too bad it's about $55 a bottle! The winery is highly-regarded amongst the cognoscenti in Austria. They make quite a line-up of wines, but we've been big fans of their Sauvignon Blancs. Pinot Blanc here has also been good. We have the 2010 Zieregg Sauvignon Blanc in the shop...a very stylish and good wine. And a recent taste of the 2007 was spectacular. 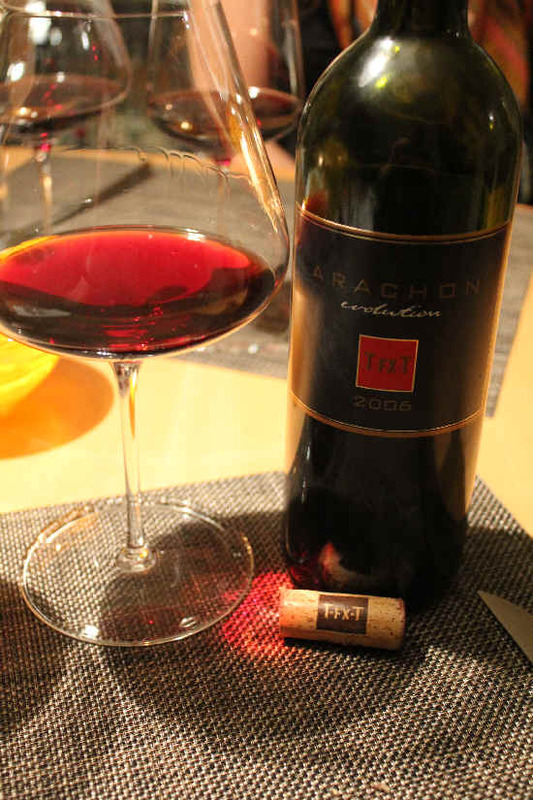 The 2007 still tastes youthful, fresh and with a long life ahead of it! I tasted a whole flock of new, single-vineyard wines from Tement at a trade event in Europe...it will be interesting to see how the overall quality of their wines holds up given so many new offerings. Can they continue to be successful with so many bottlings??? Time will tell. With about 35 hectares, Tement's wines are in such great demand, that he's got them sold before they're even bottled. 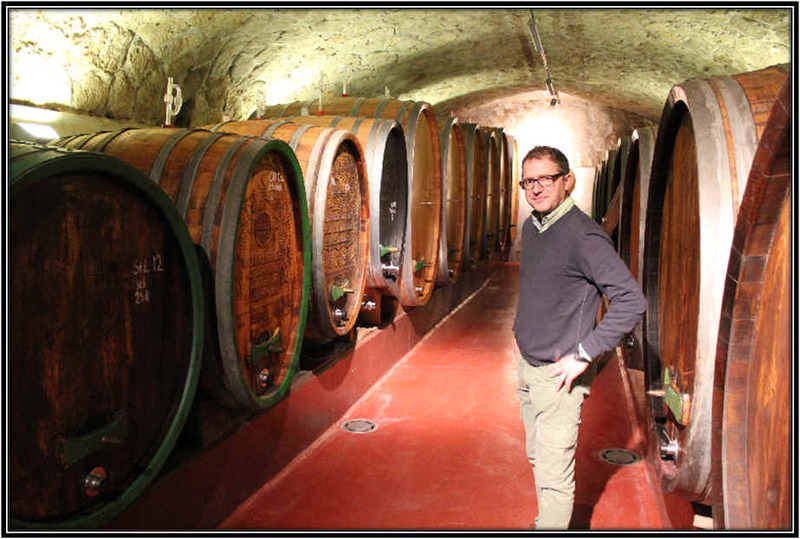 Manfred Tement in his spacious cellar. We have Tement's "regular" bottling of Sauvignon Blanc and it's a leading Austrian white wine. Oak is not a noticeable part of this wine. It's quite dry and shows hints of citrus and herbs. You can't mistake it for Chardonnay (a major 'plus' in our book) and it's got really nice balance between the acidity and fruit. The wine is lovely with seafood...Bob prepared some prawns as part of a salad recently and this was absolutely outstanding! Tasting the Tement line-up at the winery tasting room...well worth a visit, by the way! Tement's 2005 Pinot Blanc, which goes by the German name of Weissburgunder, was a delight! Here's a wine that's less than 12% alcohol (unheard of these days in California!) which is non-oaked (unheard of these days in California, practically!). It offers fresh, bright, appley/pear-like aromas on the nose and leaves a crisp, tangy, zesty impression on the palate. It's a wonderful warm weather white and pairs well with seafood or mildly-seasoned poultry. Three notable Austrians head up the "Arachon" project, the name being a medieval designation for the site called in the olden days "Horitschon." The initials stand for the three musketeers (or muscateers, if you prefer), Tibor Szemes, Franz Xavier Pichler and Manfred Tement. They have arranged with 25 winegrowers, covering some 19 hectares. Their idea for this Mittelburgenland is to reduce yields in the vineyards (and they pay the growers considerably more per kilo than they'd get normally, of course) and make a wine of international quality. We first ran into this wine at dinner in a small, comfortable dining establishment in the S�dsteiermark. It was delicious! The base of this blend features Blaufr�nkisch, with some help from Cabernet, Merlot and Zweigelt. The wine is matured in new oak for a little more than a year. I saw it in the catalogue of a local distributor and attempted to order some. I am probably one of two or three people in the area who have even half a clue about this wine, but it was "locked up" for special customers! They finally deigned to part with a few bottles for the likes of us. We had not seen the wine in a few years and were delighted to become reacquainted in the Spring of 2014. We tasted the 2010 vintage and it's excellent! A really solid, beautifully-made blend with nice oak and plenty of fruit. The wine is drinkable in its youth and certainly has cellaring potential. Look at the color...the wine is still showing beautifully...a handsome, woodsy red blend.